THE MASTER SUITE COMES COMPLETE WITH A QUEEN, solid Oak Bed and LUXURY BEDDING from Restoration hardware and France. Antique furniture accent the room along with a giant 19th century painting as the suite focal point. THE Second bedroom is also accented with luxury linens from france and antique rug pillows. Antique Bird prints in their original frames hang above each metal bed frame. THE KITCHEN FEATURES A DOUBLE-WIDE Stainless SINK, Pottery Barn LIGHTING. antique and vintage dishes for your day to day needs sit on open-face shelves. We also offer up a Fellow pour over coffee maker and locally sourced coffee, granola, and pastries (depending on the day) for those who love being food pampered. 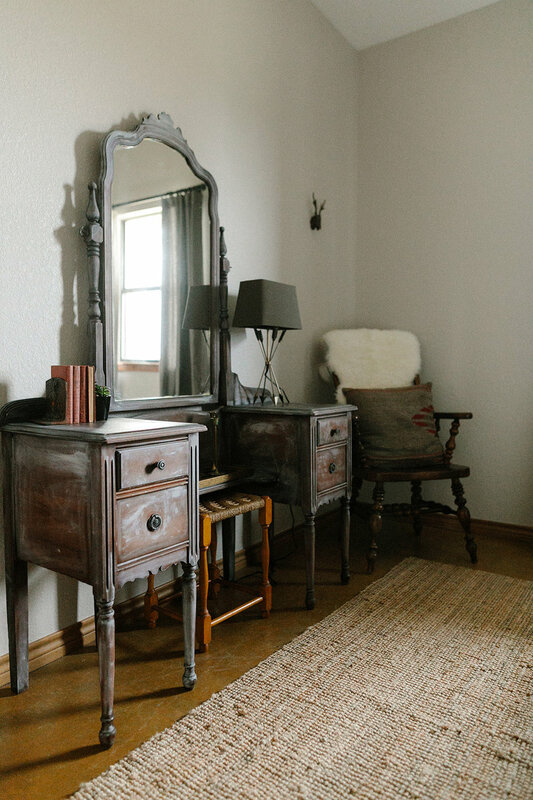 The living area is adorned with textural pieces, Antique paintings, and antlers from the property. A focal point constructed from found baskets rests above the enterntainment space. A wonderful space for gathering. The Grounds around the casita feature a front and back porch outfitted with chairs made to sit a spell. A custom-made, outdoor fireplace is perfect for taking a glass of wine and relaxing with a loved one or friends.